We joined a CSA this summer and my goodness, the bounty has been fantastic. I've gone a little crazy and ordered some bulk fruits for canning. 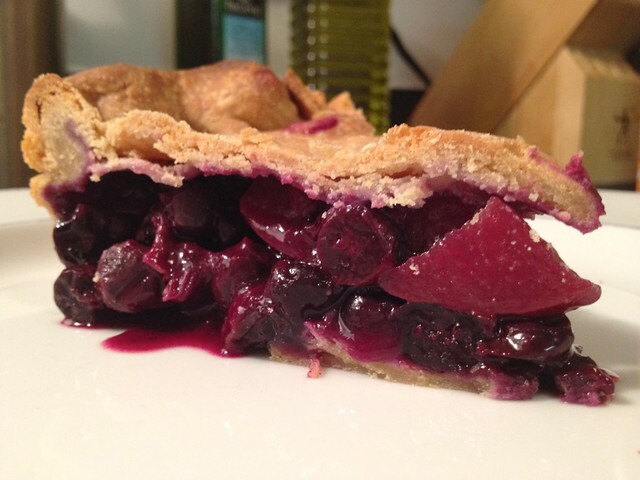 I took some of the blueberries and nectarines and whipped up the Blueberry Nectraine Pie from Baking with Julia with some of our extra fruit. It was so tasty just a bit too sweet for my taste. I was tempted to whip three of four of these and freeze them but our freezer is already jam packed with pesto, corn and frozen berries. I was not such a fan of the pie crust. I used whole wheat flour because that was what I had. I have made enough pies in my time to have my favorite doughs and I am not sure this will be at the top of my list. Good dough, just not amazing. I followed the recipe as written. Find the recipe at Baking with Julia by Dorie Greenspan or visit Liz at That skinny chick can bake!! and Hilary at Manchegos Kitchen the TWD hosts. 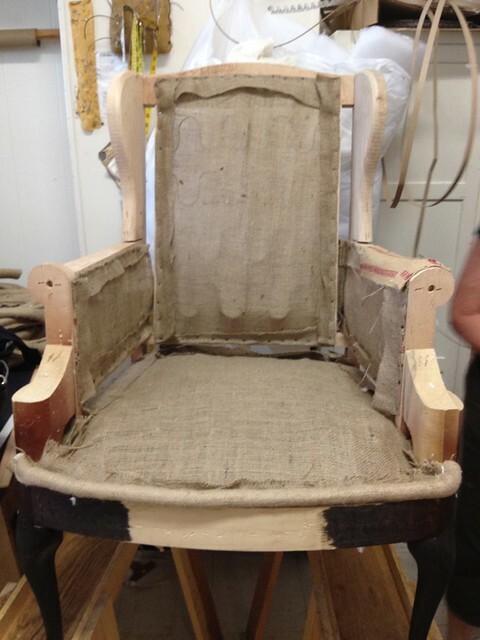 I just wrapped up my first class at Upholstery on Broadway. I had been looking for a class to take for the last two years but the hours offered by another school did not work with my schedule. So on a whim, I googled upholsters with the intention of calling each shop in a 10-mile radius from me and asking for a private class. Then I found a little website for a shop in Arlington that not only offered classes a ten minute drive from me but also offered weekend classes! The shop is tiny, cute and bustling with activity. 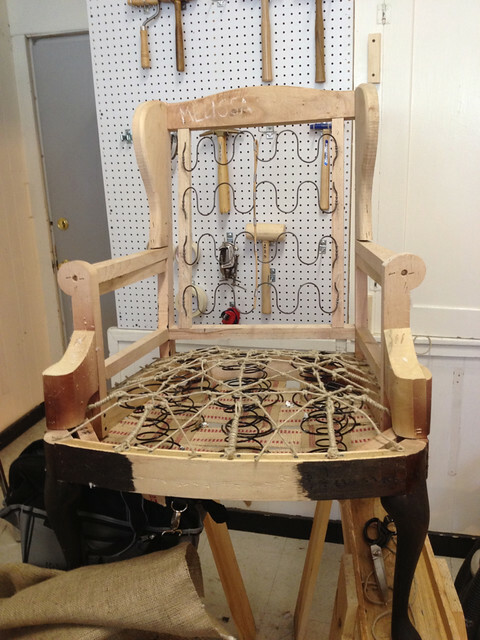 Pamela and Kevin (the master upholsterer) are kind, funny and such great teachers. I brought in one of my Kennedy chairs (we found them on the side of the road in Cape Code last summer) and stripped poor little Jackie down to the bones. The stripping took a couple of hours on and off over a week. 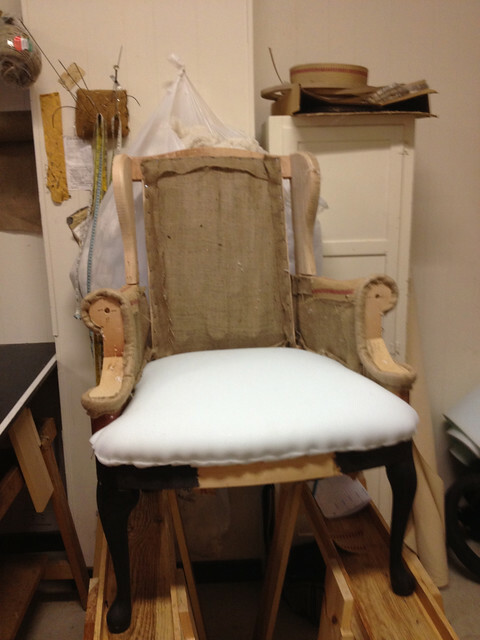 The chairs were solidly built and not in bad shape save for the salmon colored fabric but the insides were cheap-o. I replaced the plastic webbing that was originally used with some beautiful jute like webbing. The difference in quality and strength was staggering. 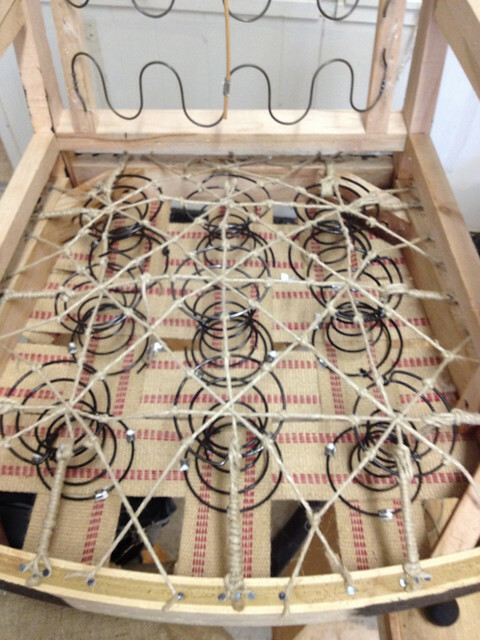 I used some old springs and learned how to do an 8-way tie. It was so time consuming but well worth it. Just a couple of improvements in quality materials and the chair went from feeling like a cheap run of the mill wing back to something worth keeping. I tacked some burlap over the springs. And finally some edge roll on the front arm panels and foam on the seat. This is how far I got on my little Jackie. 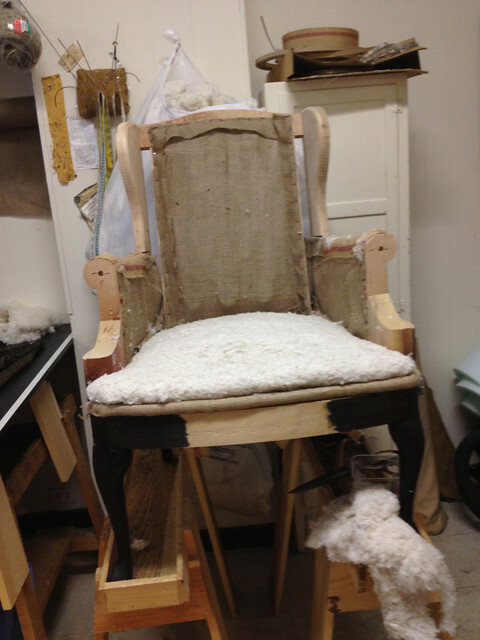 I did miss two classes so I think I could have made even more progress on the chair in one session. I plan to enroll in another class in the Fall after Pamela and Kevin (the owners) re-open after summer break. I am going to strip and do a little coil tying on Jack over the summer and if all goes as planned, these babies will be sitting at the heads of our Thanksgiving table. 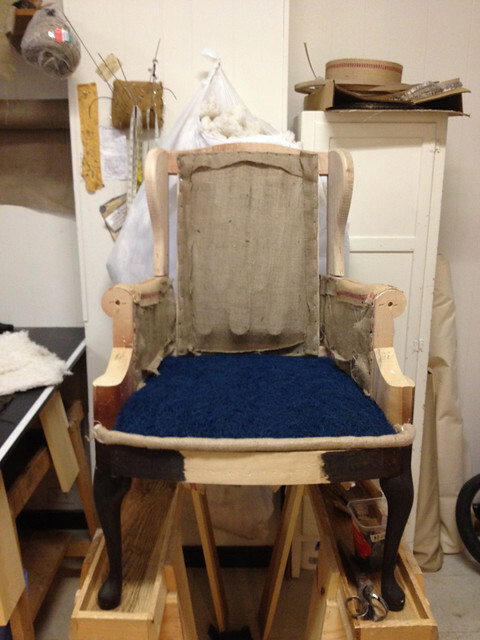 If you have been considering taking an upholstery class, I strongly recommend Pamela and Kevin and their little shop, Upholstery on Broadway. We love pizza. I am not sure that love even captures the complete feeling we have over our favorite food. There is a pizza restaurant down the block from our place and we hit it up every Friday night. They have a beet salad that the baby loves (the wait staff are always amazed to watch him devour it) and pizza that is good. Really good. So when the the TWD recipe for the month was Pizza Rustica, I was ever so eager to try it. I read the recipe and scratched my head. "How is this a pizza?" I wondered. I threw my confidence into Julia and Dorie and went about making this. Along the way I stopped and questioned what Julia and Dorie were thinking. I finally gave in and declared "We love pizza and we love pie!" I then crossed my fingers that it would all work out in the end. You know what? It did. This little pizza is it's own thing and a delicious one at that. Make sure to let it cool. We couldn't wait and got a gloppy serving that tasted great but was well, gloppy. I followed the recipe as written. 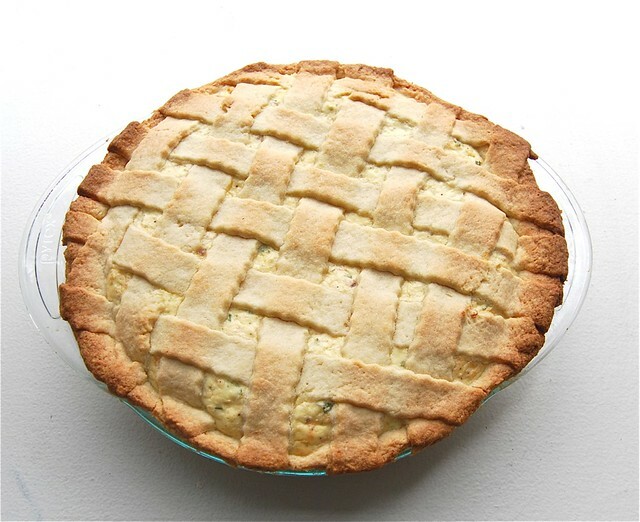 Find the recipe at Baking with Julia by Dorie Greenspan or visit Emily of Capitol Region Dining and Raelynn of The Place They Call Home, the TWD hosts. Jam + Cookie = Perfection. The Hungarian Shortbread recipe calls for a batch of rhubarb jam and the crumbliest shortbread dough I have ever had. I chose to stick to the recipe as it was written and was excited to find rhubarb at Whole Foods. When my child saw it he asked if it was red celery. I am sure it isn't local as our harvest season is a month away but it did yield a sweet and sour jam. The rhubarb jam recipe is very simple. You just take the ingredients and dump then into a saucepan to simmer. The dough came together beautifully and I decided to use my food processor to grate the dough rather than grate it by hand. I am not sure how much of an impact it made on the recipe. I will probably try to skip that step in the future and just transfer the dough after it is combined rather than freezing and grating. After reading through the Tuesdays with Dorie P & Q comments, I decided to pre-bake the dough before adding the jam and topping layer. It was a smart move and ensured that my shortbread was baked through. I cut the shortbread into two bite sized pieces and once I saw how much the recipe and my cutting yielded, I froze half of the batch. The shortbread was so delicious. It is perfect for a brunch or a hostess gift. 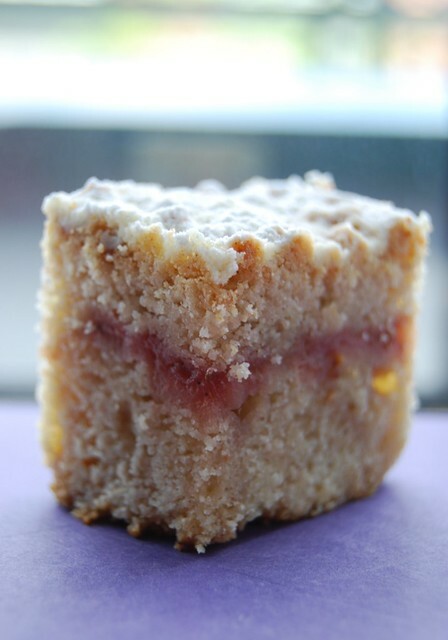 The only change I would make to it is to double the rhubarb jam recipe and add more of it to the shortbread. I felt like it needed a bit more jammy flavor. I like that the recipe lends itself to variations like using high quality jams or lemon/citrus curds. I followed the recipe as written. Give the Hungarian Shortbread a try! Find the recipe at Baking with Julia by Dorie Greenspan or visit Lynette of 1 Small Kitchen or Cher of The Not So Exciting Adventures of a Dabbler…, the TWD hosts. My boys love pasta and I am often on a search for great pasta recipes. 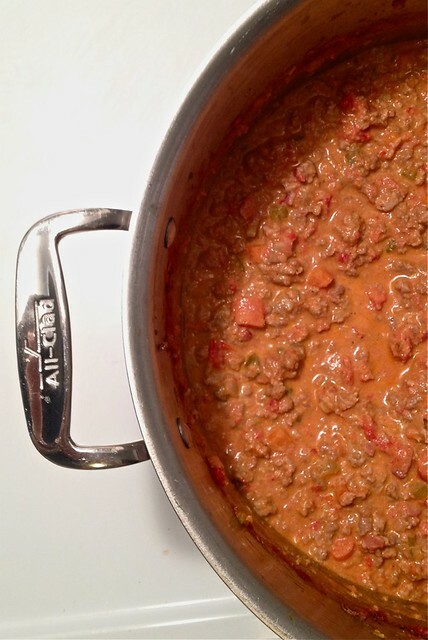 I wanted to sneak in some meat and veggies and decided to try the Bolognese recipe from How to Cook Everything. It was a recipe that calls for a little planning and an open afternoon. A rainy afternoon was the perfect block of time to watch the sauce and let it simmer on the stove while the boys played with legos and watched some vintage Tom and Jerry cartoons. The recipe was straight forward. I was worried that the texture would be enough to alert the boys that something was different but it wasn't. I served three little boys three big bowls of pasta bolognese and they ate up every single last bite. They needed an extra long bath to clean their saucy faces and hands and our dinner napkins had to soak in hot water to ensure the stains would come out. The next time I prepare this sauce, which may be monthly if not weekly, I think that I am going to double it and keep a batch in the freezer to save us on those nights that little league runs late. I followed the recipe as written. Find the recipe at How To Cook Everything by Mark Bittman. I missed out on baking with the TWD group for the last two months. Life got a bit busy and well things just happen. Today, I looked on the calendar, I realized I could fire up the oven and squeeze in a recipe and blog post. I must start with the fact that lemons are my least favorite dessert flavor. I avoid lemon meringue, key lime pies, lemon sorbet and even lemon flavored life savers. Seriously, me and lemon no-go but my husband LOVES lemons in anything. So when I saw that today's recipe was the Lemon Loaf Cake, I thought that my sweet Mr. Erick would enjoy coming home to a freshly baked treat. I even made a quick run to the store for some Meyer Lemons. The recipe was a breeze to make. It came together quickly and called for such simple ingredients that I was beginning to feel a bit more open minded about my whole lemon issue. Look at it, picture perfect and very inviting. The first taste was...not so bad. 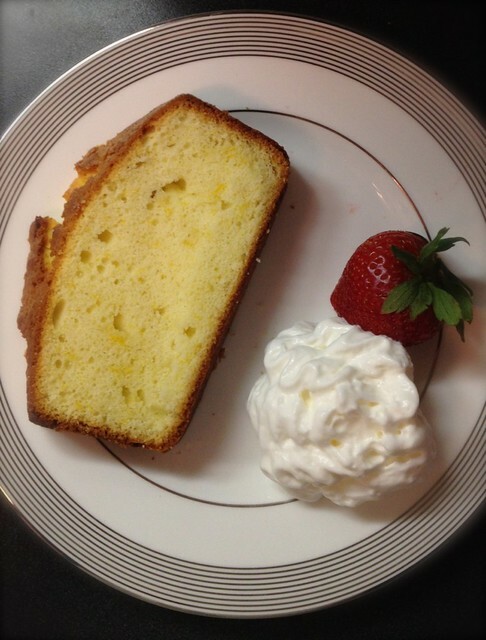 The lemon taste was just enough and the texture was amazing but I am partial to pound cakes so all in all, I liked it. My husband thought it needed a stronger lemon flavor. Will I make it again, YES! I do think that I will make a quick loaf when we have overnight guests or family breakfast at my sons' school. I followed the recipe as written. In the mood for some sunny and cheery Lemon Loaf Cake? Find the recipe at Baking with Julia by Dorie Greenspan or visit Truc at Treats or Michelle at Ladystiles, the TWD hosts. i just came to accept that i have not kept up with my tuesdays with dorie group. gulp. things got busy and before i knew it, i found i was too tired and not to inclined in consuming extra calories from the baking with julia cookbook. but i am back and now i have a ton of catching up to do. so come back around in the next week or so to see just how much work i procrastinated myself into.